Someone, I’m sure, has written about how difficult it is for addicts to kick their habits unless they stop frequenting the same places and keeping the same company with whom they developed the habits in the first place. I think that someone is right, which is why I’m going to have to write off the handful of college “friends” who are still dogging my tracks, keeping me in VW Prison. The primary culprit, a man I’ll just call CW, got me started down this path back in 1974 or so, inviting me to learn how to drive a manual transmission by taking over the controls of his 1968 baby-poop-yellow VW bus while a group of us were driving back home from a winter jaunt up in the White Mountains of New Hampshire. As I recall, that particular bus broke down at 3 o’clock in the morning just a few miles north of our dorm at the University of Connecticut. You’d think I’d have the sense to take that as a warning, but the VW loosey-goosey toy stick shift feeling has stuck to my hand ever since. That was the same trip, I think, during which I slept across the front seats, feet propped up on the steering wheel, wrapped in an interesting variation on the concept of “sleeping bag” – a one-inch thick piece of foam, which supposedly increased in thickness as you cinched it tight. Nice idea. Too bad I didn’t have the sense to test it before spending a night in it at 16 degrees below zero. And that was the trip that … no, that story will have to wait for the category Winter Camping Disasters. Not having learned my lesson about VWs, I was foolish enough to join CW, a couple of his Pennsylvania buddies, and a Former College Roommate on a cross-country trip to the Canadian Rockies. Besides changing my life 33 years later, that trip lured me into the clutches of VW-mania for what has become a very long time. I especially liked the way the vehicle seemed to miraculously right itself after being driven off the road by a driver who was trying to steer while simultaneously cleaning the windshield by reaching out the side window with a camping pot full of water. It turns out that if he had simply pressurized the fluid reservoir, the built-in windshield washer would have worked. I know this for a fact, because when I bought that very same bus from CW, its engine in pieces in several cardboard boxes, for $400 cash (another warning that I ignored), I performed that routine bit of maintenance, and voilà! And I liked the smell of hot oil on baking asphalt, as the rest of us waited while CW hitched into the next Wyoming town, only 50 miles away, to pick up some more motor oil. Seems he decided that the oil in the crankcase was dirty. He had one extra quart of oil, so he parked us by the side of the lonesome highway in searing summer heat, then unscrewed the drain bolt, thinking to let about a quart out, pop the bolt back in, and add the spare quart. When the draining oil, a few hundred degrees hot, hit his hand, he dropped the bolt, and 2.5 quarts of good Quaker State motor oil – the total capacity of a 1600cc VW engine – spilled on the pavement in an ugly black pool. So off CW went for more oil. I remember how, while waiting, I dug up a spindly little Wyoming pine seedling, put it in an empty tennis ball container, and presented it to my mother upon returning home to Connecticut. She planted it, and the damned thing survived. There are other VW stories, of course. Anyone who’s owned one for any length of time has them. And I’ve owned one or two, pretty much continuously, since that day in 1977 when I towed that baby-poop-yellow VW bus home, where I would learn all about internal combustion engines with the help of a mechanic’s book called How to Keep Your Volkswagen Alive: A Manual of Step by Step Procedures for the Compleat Idiot (for Sedan, Ghia & Transporter) by John Muir. The other John Muir. And illustrated by one Juniperus Scopulorum (the scientific name for Rocky Mountain juniper), who, based on the drawing style, just might be Robert Crumb. So, now and here, in January 2013, what shows up at my front door, personally delivered by CW’s local accomplice KGB, but a large gift-wrapped box? And what do I find inside that box but a VW bus? And, like the very first VW I owned, it came in pieces, 1,332 of them. That’s probably about as many pieces as I put together in the cool shade of the shed behind my uncle’s house back in 1977, when I experienced, for the first time, the magical feeling of turning a key and hearing an engine I built start up. And run well enough to bring me here to Oregon. 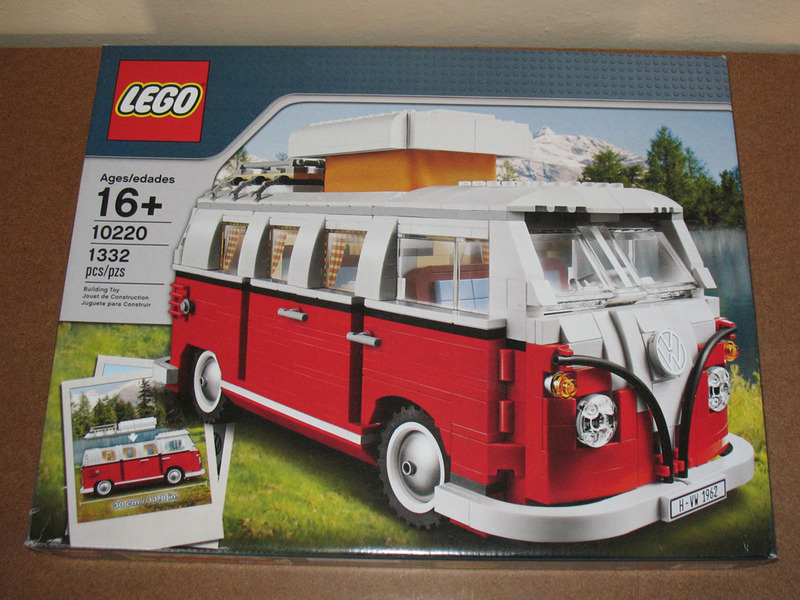 Still, a cell is a cell no matter how nicely equipped, and I fear, by accepting this gift and assembling its 1,332 pieces, I will never be allowed out of VW Prison. “Verboten!” Oh well. Keep On Truckin’.